Another fun weekend just puttering around the house, getting things done. My first priority was fixing my shower faucet. I failed but it's ok. The showerhead started dripping around 5 months ago but I have put off fixing it because it requires turning off the water to the house and I was afraid that I would break something and I would be without water and then I would have to take a day off of work to wait for a plumber. This weekend seemed like a good weekend to try to fix it since I didn't have any guests and I have enough vacation days in case of emergency. I got out the special tool that my co-worker lent me, turned off the water to the house, sprayed some WD-40 on the nut and attempted to loosen it. It did not budge. I can see how people who are stronger than I am might break the pipe while trying to unscrew this thing but there was no danger of me breaking anything except maybe the screwdriver that I was using for leverage. I gave up and turned the water back on. Luckily, there was no wild spraying of water or anything else dramatic. I was relieved that there was no need for an emergency call to a plumber and also relieved that I had tried and failed and could move on to the next chore on the list. 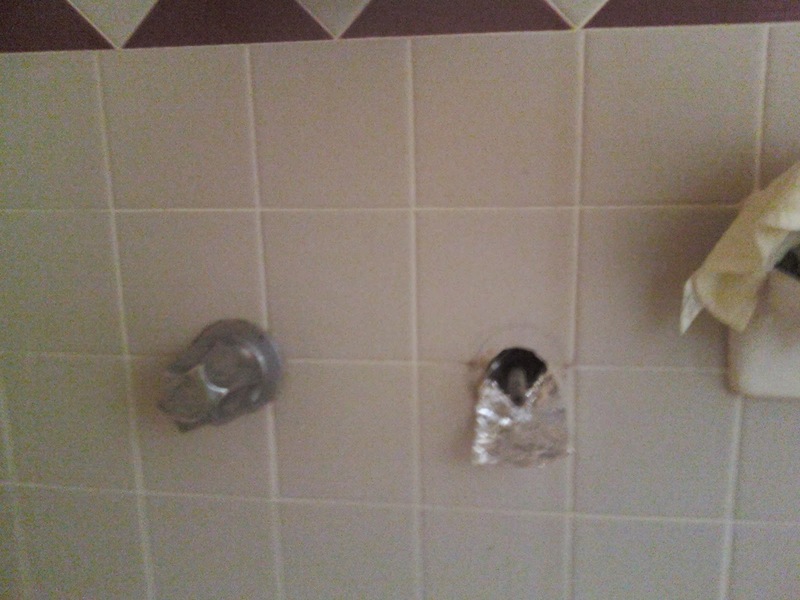 I put aluminum foil around the faucet stem so that when it drips it will drip in to the shower instead of in to the wall. It only seems to drip when I turn the cold water on. This chore has now moved off my urgent list and is on my "when I get around to it" list. I'm thinking that I should buy a new showerhead and controls and have a plumber install them for me when he replaces the faucet stems. That will be part of my bathroom renovation when I get to it. Original 1975 faucet stem. Not going to budge. For the rest of the weekend, I was trying out kitchen ideas. I've been changing the curtains with fabric that I have around the house, sheets, dish towels, blanket throws. I haven't found the right color combination yet. That's a work in progress. A brilliant idea hit me when I was trying to make my kitchen more practical. 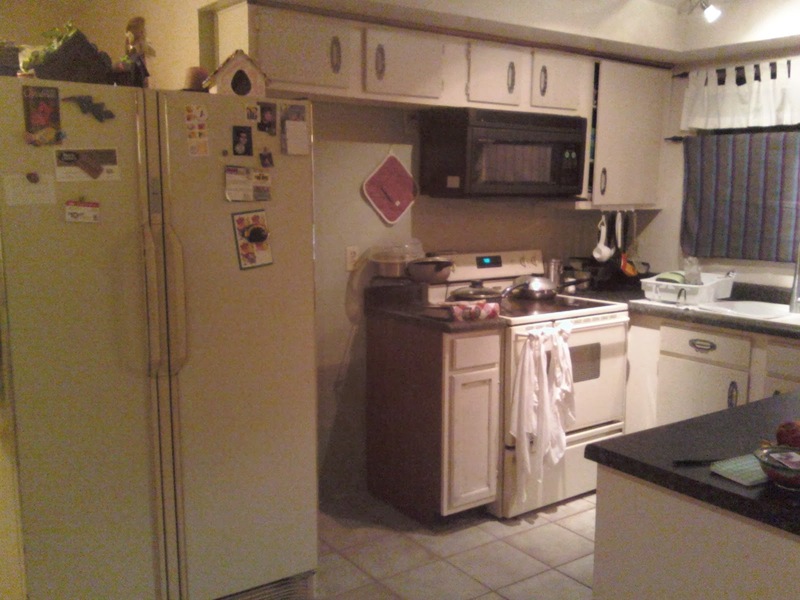 I moved the refrigerator out so that it backs up to the washer/dryer and frees up space next to the stove. I don't know where my before picture went to but you get the idea. The fridge used to be under the top cabinets. Then I hung a curtain rod under the cabinet and hung the pots and pans from hooks. Later, I will add a butcher block (or something like it) countertop and a shelf or two. I'm still not sure where to put the lids. 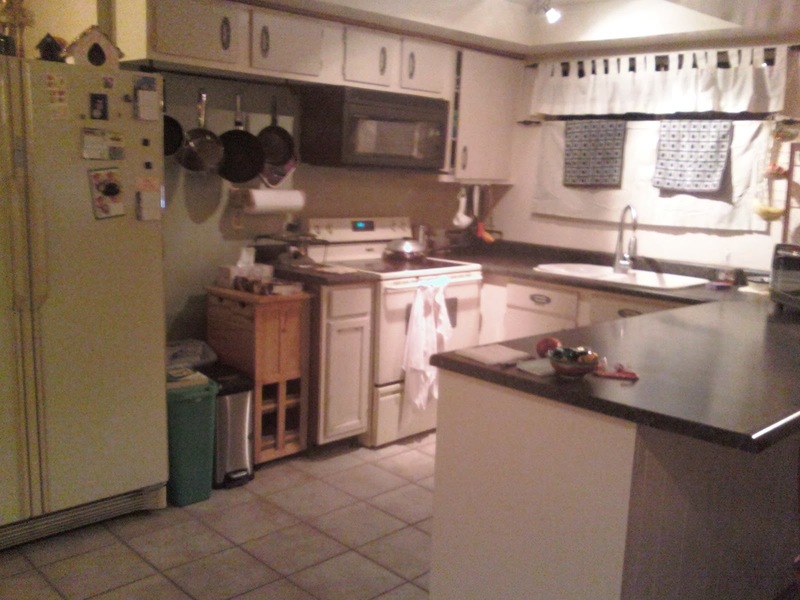 It still needs curtains, paint or tile backsplash or both, new light fixture, and cabinet help. Oh, and the light switch is now blocked by the fridge. That's a bit of a problem. Anyhow, it was fun to try things out to see if they would work. It only cost me $6 for the curtain rod and I think it looks great. I will now wait for more great ideas to pop in to my brain. I agree. The top of the fridge is not convenient for anything other than decorations. Maybe a vase or pitcher or tea pot.